Carol Silver’s seizures weren’t stopping. At 10 p.m. on Friday July 26, 2013, the 66 year-old nurse was transferred to the care of Dr. Stephan Mayer, director of the Neurological Intensive Care Unit (ICU) at Columbia-Presbyterian Medical Center in Manhattan. By 5 a.m. the next morning, Silver was in a coma. Mayer’s team imaged, biopsied and inserted probes into her brain — an uncommon, advanced technique for this kind of case. Mayer was cautiously optimistic as he reviewed the probes’ output: color-coded line graphs streaming the physiological play-by-play of Silver’s brain. Yet after two weeks, Silver still hadn’t awakened. Her husband was ready to discontinue life support when — 30 pounds lighter, with probes poking out of her shaven head — Silver opened her eyes. Shortly after, she left Mayer’s unit, on the road to recovery. Today, the three seizure medications she takes daily and the cane she uses to walk around her new home in Piedmont, Fla. are her only reminders of the experience. Mayer is a neurointensivist, a doctor who combines conventional critical care medicine with neurology to treat coma patients with acute brain injuries such as stroke, trauma, cardiac arrest, seizures and brain bleeds. He’s an undisputed leader in the rapidly growing specialty of neurological intensive care, noted Dr. Marek Mirski, a peer in the field and director of the Neuroscience Critical Care Unit at Johns Hopkins University in Baltimore. While his modest frame might suggest otherwise, Mayer, 51, has a reputation for pushing the envelope. “There’s a sense of impatience in Stephan,” said Dr. Claude Hemphill, director of the Neurocritical Care Program at San Francisco General Hospital Medical Center, who has known Mayer for about 15 years. The probes inserted into Silver’s brain, and those of hundreds of other patients, are part of a multimodality brain monitoring system pioneered by Mayer’s ICU. The probes give Mayer real-time data on the chemical, electrical and metabolic activity within his patients’ comatose brains. Small electrical storms, undetectable by surface electroencephalography (EEG) monitoring, can be thwarted with anti-seizure medications before the power goes out. His 18-bed ICU is one of only a handful of units in the country using this advanced technology. In 1988, Mayer, who did his medical studies at Cornell University Medical College, entered Columbia-Presbyterian Medical Center eager to begin his neurology training. He quickly learned the work comprised more waiting than doing. “There was a prevailing dogma that once you were brain damaged and in a coma there was no potential for recovery,” Mayer recalled. So instead of actively treating the injured brain, neurologists performed lengthy bedside examinations, made diagnoses and watched as their patients “hung around like museum pieces” before dying. In 1994, Mayer was put in charge of Columbia’s brand new Neurological ICU, six months before his two-year fellowship was set to end. The unconventional thinker became free to pursue his far-fetched aspirations. At a conference in 2001, Mayer heard about multimodality brain monitoring — a new technology for comatose patients suffering from acute brain injury. The technology involves drilling holes into a patient’s skull and choosing which, out of a variety of probes, to insert into the brain. Each probe collects different information in real time, such as intracranial pressure, oxygen levels, blood flow, sub-surface brain waves and metabolic activity. As these changes happen, physicians can intervene — providing anticipatory rather than reactive treatments to establish and maintain optimal brain health. A self-described “unapologetic early adopter,” Mayer began rallying the troops. By 2006, he received funding from The Dana Foundation, picked a few probes to try and began collecting data from his ICU, at a rate of two to four patients a month. Just three years later, Mayer published his first discoveries. A year after, he had all the probes in his ICU. “He won’t just accept the status quo,” Hemphill said. “He’s passionate about the field and believes there are better ways to treat patients.” For example, Mayer has used a microdialysis probe to see when a patient’s brain fuels — glucose and oxygen — are running low. Before the tank hits “E,” he intervenes, avoiding disaster. “Unless you’re monitoring the brain directly, you’re essentially guessing,” Mayer said. Yet despite his discoveries, Mayer knows not everyone is on board. Implementing the technology is extremely costly and labor intensive and there is limited clinical evidence to support it. “There’s a lot of pressure to adopt these tools, but they’re not all ready for prime time yet,” said Mirski, whose Johns Hopkins unit only uses intracranial pressure monitoring, instead, relying heavily on noninvasive brain monitoring techniques. Mayer is hopeful his work can change the minds of colleagues like Mirski. 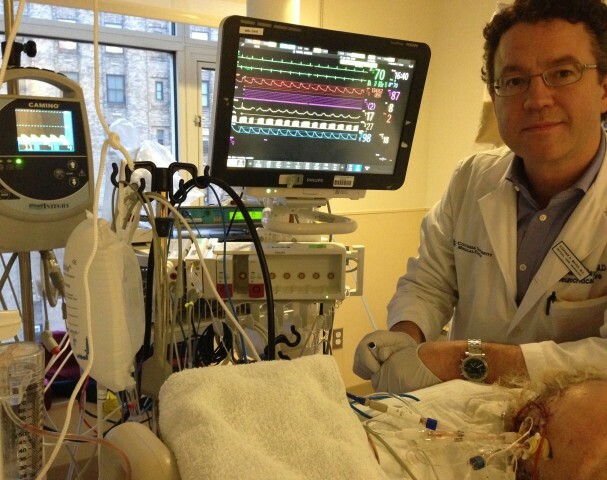 Aside from being on service in the ICU, leading a handful of clinical trials, lecturing and writing grants, textbooks and papers, he’s now doing something no one in the United States has done before: putting the probes in cardiac arrest patients. Their oxygen-starved brains, he’s found, are vulnerable to secondary injury for a full 72 hours following the initial event — invasive multimodality monitoring has made previously undetected changes in brain tissue oxygen levels, electrical and metabolic activity, intracranial pressure, cerebral blood flow and brain temperature observable. Measures such as altering a cardiac arrest patient’s temperature and administering medications to address such dynamic shifts in physiologic behavior make a strong case for Mayer’s probes.